The House: Then and Now! Evidently, at some point a few weeks ago, I got drunk at a party. Evidently, I started talking to a friend/acquaintance about my house, and how I’d never seen an old picture of it. Evidently, he jotted down my address to ask his friend what he could come up with. I don’t know who this friend of a friend is, and I recall 0.0% of this event, but this mystery person came through for me! So last week, I got a photocopy of the assessment record of our house, which includes a photo from 1950! Our house is outside the fancier/more historic Uptown Kingston area, so it’s situated in an area that doesn’t seem to be heavily documented, despite how many cool homes there are in Midtown. We still don’t know the exact year that our house was constructed (we think 1830s or 1840s, based on the style and the post-and-beam construction), or when the additions were put on, or really much information at all…but seeing this picture taken in 1950 nearly brought tears to my eyes. Really. You see, I love this house so much. I’m putting my blood, sweat, tears, and pretty much all of my money into it. I loved it from the second I walked in the front door, and I love it more everyday as it comes back to life. I don’t feel like this is bragging, because I can’t take any credit for it: it’s a beautiful house, in my eyes at least. 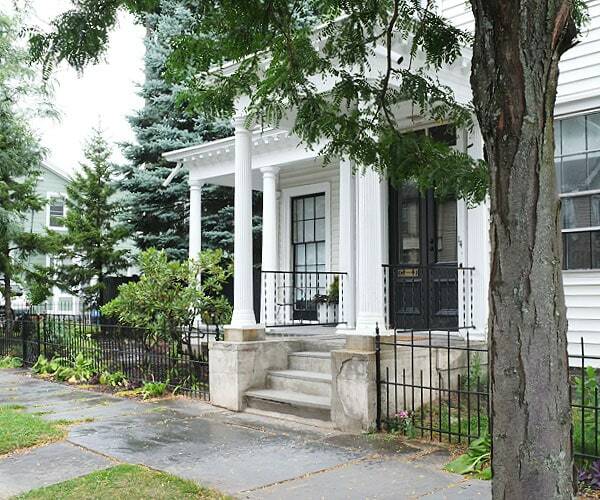 Sure, it isn’t a super fancy architectural gem of a Greek Revival mansion. Sure, it doesn’t hold a candle to so many of the amazing structures throughout Kingston. Sure, it had some regrettable things done to it over the years. But honestly? There’s no way we could have bought it if it hadn’t been a little busted, and I feel overwhelmingly fortunate and grateful everyday that I’m the lucky person who gets to restore it. I’ve learned enough to fill a book. My house has taken on a whole personality in my eyes, and all I want is for it to be happy. I’ve never seen anything but potential here, and even after a year of tough, trying renovation and years more ahead, it’s that amazing potential that keeps me motivated. I feel like this is the place where I belong. I love Kingston, and I love this house, and I hope that all the owners after me will feel exactly the same way. It’s a special place. OK, I’ll stop cheesing it up now. I have feelings, OK? By 1950, when this photo was taken, the house was likely already over a century old, which is a little hard to wrap my mind around! I know the Europeans out there reading this will laugh, but this is considered a really old house in the States. The fact that it’s still standing with so much original stuff intact is pretty incredible. The point here is that this isn’t a glimpse at the original house—just what it looked like 64 years ago. Still, lots of stuff happened in that amount of time. Since the photo was taken, the house had two subsequent owners, and then me. The owner during this period had already split the house into 2 apartments (that happened in the 30s). The next owners bought in ’63 and sold in ’74, and we bought the house from the estate of the people who bought in ’74. Amazing, right? I think the fact that it only had three (4, including me) owners in the past century probably has a lot to do with why it wasn’t too wreckovated to be rescued. OK, enough rambling. LET’S COMPARE PHOTOS, SHALL WE?? I should really save this post for the winter since that’s when the original photo was taken and the tree wouldn’t be blocking half the house, but I’m too excited! Sorry. OK, so the first thing I noticed (AND FREAKED OUT ABOUT) is…there are extra windows!! See them? On the side of the house, second windows in from the corner. Upstairs and downstairs, there were windows! I’ve always thought the front of my house was really pretty, but the side…not so much. It’s an awkward mash-up of strange additions, and it lacks the nice balance of the front. I’ve always sort of thought that aesthetically there should be windows there, but there wasn’t any evidence that they ever existed, and additional windows in those two rooms would effectively eat up any usable wall space (the interior walls all have doors and, originally, wood stoves, so there literally wouldn’t have been walls spanning more than a few feet!). The weird thing about the windows is that I’ve stripped all the paint/wallpaper from our bedroom (which is where the missing window on the second floor would be), and the walls are all the same plaster—there’s no evidence of a window being patched in. NATURALLY, after seeing this photo, I cut a hole in the wall in the downstairs room (which is the future library space) and found….plaster, lath, and BRICK. All of our exterior walls are full of brick and mortar—it’s a type of insulation called nogging that pretty much stopped around 1900. And the walls are really, truly lath and plaster, not just a plaster veneer over old drywall or something. They wouldn’t have filled the walls with brick between 1950 and whenever the windows were removed, because there were better products for insulation by then. Given all of this, I have pretty much decided that those windows…FAKE! You can see that they’re both shuttered closed. Originally, the entire house would have had shutters, so it would have made a little more sense aesthetically…but I honestly believe that there were never windows there, and the house was built with faux windows on the exterior to provide the architecture more balance (while still allowing those rooms some actual walls!). So crazy, right? The house has always been a little bit fake-y! It makes me feel a little less silly about installing a fake fireplace and new-production ceiling medallions made of foam and all that. If it looks right, maybe that’s just good enough. This is also good to see, though, because it shows what the original shutters looked like. Getting shutters to look right is a tricky thing since there are a lot of different styles, but if I can ever save up the money to put shutters back on the house, at least I know how they should look. Obviously this photo was taken before the vinyl siding was installed, so I’m glad to know about this whole fake window thing! I wonder what’s still lurking under the vinyl…it makes me want to rip it off RIGHT NOW. The house looked sooooo much prettier without it, don’t you think? I know the window moldings aren’t very elaborate, but they are THERE and they give the facade so much more dimension—unfortunately, they were brutally hacked off with the installation of the vinyl, which is part of what makes the project of removing it seem like such a big deal. It’s also interesting that the corner boards aren’t wider. Wide corner boards with some decorative molding at the top is typical for Greek Revival…and the fact that this house doesn’t have them makes me feel further that the house started out as much more modest and kind of became a Greek Revival a little later, or just that it was built as a more modest Greek Revival to begin with, without all the bells and whistles that typically go along with that style. It’s hard to tell what color the house is in this black-and-white photo, but I actually think it was a soft yellow color, not white. At various times, I think the house has been white, yellow, blue, and a kind of minty green. What strikes me more is that the window sashes aren’t painted black, as they are today and as they likely were originally—indicating that one of the two owners after this one seems to have some sense for restoration and preservation of the original appearance. There is some more evidence throughout the house of earlier restoration efforts. My money is on the folks who owned the house from 1963-74, which is interesting because the restoration movement hadn’t really caught on yet at that point. Who knows! I don’t think ANY of these people had children, so I’ve had a pretty impossible time trying to track down anyone who would really know. The other funny thing about the paint is how the cornice is painted! I doubt it was like this originally, but it looks like the trim is white and the cornice is mostly white with a black (or very dark) edge just on the crown molding. Huh! Flipping between these photos also shows how many trees there were! I really kind of hate that big tree out front—I don’t know the type but I think it’s ugly and I kind of wish it had stayed about 1/2 the size. But those two trees in the “hell strip” on the side and one on the opposite corner? So nice!! It makes me want to re-plant all of them, and maybe a few more down the street. I mean, who is going to stop me? I think more trees would really give a boost to the neighborhood…it’s a little barren nowadays. The side street, for example, has NO trees at all anymore, which is too bad. I also wish I could convince the city to put in more attractive street lamps, either like they are in the 1950 picture or nice old-fashioned freestanding ones. The huge fluorescent ones at the top of the telephone poles are just so…unfriendly looking at night. I guess I should address the missing center chimney, since I know people will notice. I’m a little ashamed to say…I did that. The chimney, while beautiful, runs off-center in the house itself and then above the attic floor steps up toward the center of the roofline, effectively bisecting the whole attic. It’s a pretty crazy construction. Over the years, the stepped design had failed under its own weight, causing the chimney to sort of collapse and damage the roof in the process. Somebody added some precarious-looking bracing to hold the whole thing up, but it really just seemed structurally unstable AND would have provided another space for potential roof leaks down the road if it continued to shift over time. When we had the roof done back in November, I made the decision to have the roofers remove the chimney down to the ceiling of the attic, figuring I could handle the additional demo myself and we could reuse the bricks for landscaping (I have a plan! And yes, I know they shouldn’t be near where food is being grown because of the creosote…). This would also open up the attic into one big space, giving us potential to finish the attic someday and actually do something with it. I still wrestle with that decision, though. You couldn’t see the chimney at all when looking at the front of the house, and it seemed like the benefits of gaining potential attic space, removing a structural hazard, and giving our very pricey roof a better shot at longevity outweighed trying to keep AND repair something that would always be purely decorative (it was unlined and too damaged to be functional). So there you have it. Most days I don’t even remember the old chimney, but flipping back and forth between these two photos makes me a little sick over it, to be honest. I don’t know. I can talk about the logic behind the decision until I’m blue in the face, but at the end of the day, it was original and very pretty and from a purely aesthetic standpoint, I’m sad that it’s gone. I guess if that’s the worst thing I do to this house, that isn’t so bad. Sigh. One of the stranger and more unsightly aspects of my home is this enclosed porch. 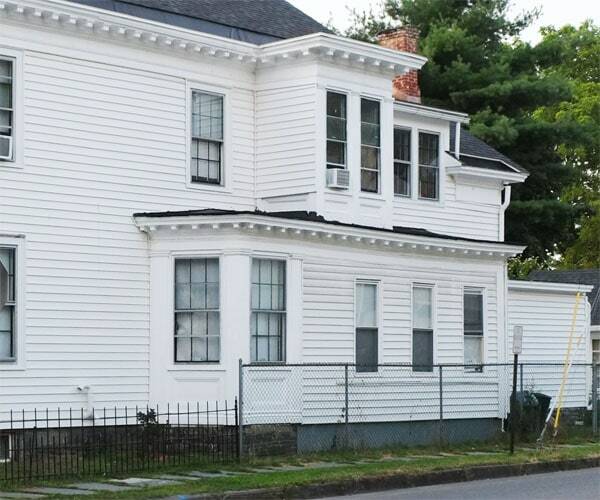 I’m pretty much 300% positive that it isn’t original—originally, there would have been a three-sided bay window on the first floor, a window next to it (which is still there in the dining room, but faces out to the porch), and one window directly above that one where that bump-out sits on the second floor. The side porch and bump-out are old, though. I need to write a blog post about it, but I recently gutted the side porch and found brick nogging in the walls at the top and bottom—likely placing its construction pre-1900. It may have even been added when the kitchen was added to the back of the house. Fortunately or unfortunately, this side porch thing has seen so many alterations over the years, and it’s in TERRIBLE shape. There’s a lot of water damage from roof leaks over the years, and the entire thing is resting on about 9 cinderblocks. The grading on the strip of land in front of the “porch” is all wrong, too, so water drains back toward it instead of away, causing the already weak foundation to have more problems. The bump-out above is sort of a charming detail, but unfortunately you can see that the windows on the sides were removed and patched over at some point, which is super lame. Anyway, the whole thing is sagging and just generally looks pretty awful. They did a nice job when they added it—patching in with a matching cornice and everything—but still…it’s a mess. I always assumed that the side porch was, at one time, an open-air porch, probably with columns, much like the porch on the front of the house. But I don’t think it ever was! Gutting the interior revealed that there appears to have always been a very low wall in the front across the entire length and a window at the opposite end. So seeing this picture from 1950 is pretty amazing! If that isn’t what the porch looked like originally, I think it’s very similar—basically a wall of glass with a central double-hung sash window to allow for ventilation. The only access was from a doorway in the kitchen. I’m guessing the original function was almost like a greenhouse, allowing the occupants (or the servants, more likely) to grow various plants, start things from seed, that kind of thing. To restore both the bump-out and the side porch, we’d need to do a ton of work. The structural issues are a real problem (it would need a new foundation and lots of repair work to the rotted parts of the framing), and we’d need to somehow replicate that wall of glass, find 2 six-over-six sash windows (one for the front and one for the side), and 2 more two-over-two sash windows for the sides of the bump out…and even then, what do we really gain? Even in this picture from the 50s, while the side porch is definitely MUCH cooler, it still makes the house look pretty unbalanced and ruins the effect of the original bay window. The vintage car parked in front of it is kind of my favorite part of the whole set-up, but we don’t have one of those. I think the current plan is to just eliminate it entirely, which I know might be controversial. We’ll need one six-over-six sash window for the upstairs room to replace the bump out, restoring a window to be centered above the existing dining room window that’s covered by the porch. Then we’ll need another six-over-six sash window to restore the bay window. I think we can reuse the existing cornice on these parts to patch in everything we’d need to, and a few hours with a roofer to patch in the gutter. Ultimately it will be cheaper, I think, and go a long way toward restoring the original appearance of the house. The dining room window would be exposed to the outside again, which I would LOVE—this is our south-facing side, so having all that light blocked by the side porch disaster is a huge drag. I know. I actually want to make my house smaller. I’m basically a communist! The other thing I like about this picture is seeing how the fence used to be! It’s always been a little puzzling to me that the wrought-iron fence just sort of stops where it does, and I obviously hate that it was picked up by 6′ chain link—yuck. My plan has always been to continue the wrought-iron fence line with something that’s at least the same height, since having the original wrought iron replicated is just not in the cards budget-wise. And guess what? That’s exactly how it was in the 1950s, and it looks pretty great. So much more open. You can see in the wide shot at the start of the post that this shorter fence then transitions at the back to a taller 6′ wood fence, which is also exactly what I’m planning to do. This will keep the dogs out of the side yard (right now the strip is so narrow that it’s easy enough for us to patrol to keep Mekko from running toward the low fence, which she can jump over) and enclose them safely in the back, and a wooden gate will open up to the driveway. I can’t wait to get the fence done, or at least this side. It’s going to make a huge difference. Not too much has changed around the entryway, but there are definitely some interesting differences! I love that in 1950, the house still had its hitching post for a horse and the original upping stone—essentially two short steps that you’d climb to get onto the horse. So cool! A lot of houses in the area still have their upping stones out front. It’s so charming. If I ever find one, maybe I’ll just put it back for kicks. It’s good to see what the foundation of the front steps looked like, since that’s something I’ve been wrestling with. Evidently somebody re-coated them with concrete at some point, but over the years the adhesion of the coating has failed, causing the concrete to fall off in large chunks and expose, I guess, the original concrete underneath (which is much lighter and smoother). It would be easy enough to just chip off the rest of the newer concrete coating, but then what? From the picture, it looks like at least in 1950 there was a kind of bevel detail at the front, and wider concrete bases at the bottom of the columns. The bevel detail isn’t something that ever would have occurred to me, but I think it’s super pretty—definitely something to consider trying to reconstruct. I don’t know exactly how to do that (grey tinted stucco, perhaps? ), but at some point I’d like to try. The crumbling situation we have now looks pretty sad, and kind of makes it look like the whole thing is crumbling, even though it’s just a 1/4″ of concrete that’s falling off. The underlying structure seems to be in great, solid shape. ALSO, the original balusters and handrail!! That’s DEFINITELY something I want to restore at some point. The wrought-iron stuff that’s there now just screams 1960s to me, and they look totally out of place with the house. Yes, it would be another wood thing to maintain and repaint and take care of, but I’d rather have the extra work than do all of this other stuff to the house and still have 60s metal banisters next to the entryway. It would make a huge difference. Anyway, thus ends the tour! Seeing this photo makes me SO hungry for more. I’m in touch with the research librarian at the Kingston Library to see if she can dig up anything else about the house, and I’m really hoping there are more photos of it over the years. Is there somewhere else I should be looking for this stuff? I do have to go back to the clerk’s office to keep tracking the deeds—I did go one day, but had to leave when I got to 1869, but there are deeds from before that too that I haven’t seen. It’s hard to tell whether the deeds are just conveying the property or an actual house, though, but I’d love to see how far back I can take it regardless! What do you think about all this? Has anyone ever seen/heard of faux windows on a house of this age? Does anyone notice anything I didn’t point out? Has anyone else been surprised by something in old photos of their old house? Let’s nerd out together! Wow I don’t think I’ve ever gotten something so great from being drunk at a party. What a victory. So interesting about the fake windows. I would have never guessed. Love you idea for restoring the original bay window situation to the first floor. Just wow! You have made an amazing project. LOVE IT. I have a roughly 100 year old house in Oklahoma and I was able to track some of it’s history using Sanborn Fire maps. Some maps are new enough to still be under copyright so they aren’t available for free (I used a local university library to gain access – they had a paid subscription.) Some of the oldest maps are on the Library of Congress website for free (because they are old enough to no longer be subject to copyright restrictions.) Sometimes libraries/museums even have old paper copies of the maps. I narrowed my house’s build date down to a 7 year window and found out that my house’s bay window was actually an addition roughly a decade after the house was built. I’m super jealous you have a photograph of your house – I’d love to track some down of ours. But mostly, I love how you talk about your feelings for your house. I feel the same way about ours – and it extends to our neighborhood as well. It’s been a tough start to the week here in St. Louis, but I have never been more grateful that we chose to stay here in the city, and pour our heart and soul into the renovation of our house. I’ve frequently described the renovation of an historic home as a “conversation” rather than a decision. We could have made a decision to purchase a new home in a new ‘burb somewhere, but we were looking for a conversation, a deeper dialogue about history and community and diversity. We could always use a little more talk, not less. I have seen the “fake”, closed windows before – it’s a nifty little trick on the exterior to provide balance and detail. Our house didn’t have any, but we did find a stack of the original working shutters that were once on the house. Have fun with your further research – how exciting. And take a photograph for Dear Photograph with that gem. Who knew being drunk could transpire into this! Apparently I need to drink more often. So freaking cool! 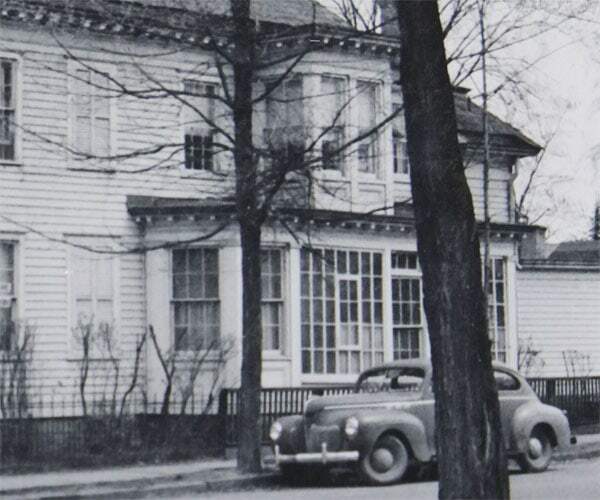 I’ve found old photos of our house when perusing our town’s historical societies web page. There was no search function, so it was just scrolling through photos that I came across them…in among the photos of war parades and such! Super cool finding old photos. We stood outside our place with the photo in hand just looking back and forth at the changes…there was a really cool cupola type thingy over the porch that I had to talk the hubby out of recreating ($$$!!). I actually love the big tree up front, it makes the house seem much more beautiful. Street was nicer back then with trees, why people cut them? I think house does need those “fake” windows. They do give it balance and an a more “expensive” look. Now that side seems more like 1950s houses which I happen not to like. I managed to find an old, hand-drawn aerial map of the town I live in now, from 1929: http://www.loc.gov/resource/g3814w.pm005290/ . I was surprised that it clearly shows the building next door as already built. The house I’m in butts up against that building (which is a series of small shops), with the windows in our front hallway closet covered up entirely by its brick sides. I had no idea it had been bricked over for over 85 years. I have no idea how old the house is (I rent), or how old the neighboring building is, but it sure makes me curious. I can’t wait to see if you manage to track down more photos! I bet you can find aerial photographs too. This is the coolest find EVER. I’m assuming that you have Google’d you address, and found nothing? Another resource would be to look up both the address and past homeowner’s names in newspaper records. Even doing some brief searches on Ancestry.com may bring something up in a newspaper. If you don’t have an account, your local library might. If you’d like me to take a look (and you don’t find my offer weird or stalkerish), shoot me an email and I’ll see what I can find. Oh I loved the pants off this post and all your posts. I notice the garage or parking pod (the building behind the house) was there in 1950 as well! Its not my house but I really hope you can restore that porch and bump out since they are fabulous in the 1950 photo! I wonder why they blocked those up with siding? Another thing I noticed was in your last post about the front door you noted that the exterior of the door was also black, that had to be either post or pre 1950 since its all white/yellow in the 1950 photo. Sorry for nerding over your house but it is really beautiful! SO cool to find an old pic! I’ve never heard of fake windows before and I kinda hope you’re wrong about them, because putting fake things in a house back then seems all sorts of wrong. But I see what you’re saying – they are suspiciously shuttered. Perhaps you have an architectural historian among your followers that can weigh in. This post really makes me realize just how much work you’ve done on the house. And how much more work you have on your hands. I’m really excited to follow the progress over the next couple years! p.s. I love that sun porch, but you’ve got to do what you’ve got to do. I’ve seen the faux windows on an episode of This Old House. They are called dummy windows. It is so interesting to research an old house. My mom got the orginial deed to our farm house and seeing the signatures and handwriting from the 1880’s so cool. You are living my DREAM. My house was built in 1880 and I’ve been trying and failing to find old pictures of it for years. I haven’t looked as recently as 1950, though, so maybe I’m being too ambitious and should look for more recent older pictures. I can’t believe those windows are fake! You’re so right! That’s so fascinating that people (architects) did that. The side of the house does look a lot better with those windows. Why do you think they took them out after 1950? Maybe new siding was easier to put on without windows. It is a great house!! Very cool. It’s interesting to me that the gutter detail stands out more in the original? Because of the difference in siding? Weird. I also like the wooden railing on the front porch better. Love following the project! Keep going:). I LOVE seeing the old image. So cool! Maybe it would be weird, but I kind of like the idea of just eliminating the handrail all together. It would make the porch more open and expansive. I dont know…just something to think about. :) I always love what you eventually do and I love that you do what you want always. I was just thinking the same thing, you could take out the handrail, at least until you have time/money to replace it with wood, then you wouldn’t have to look at the ugly metal one. Add me to the no handrail club – your front door is the show stopper and the no handrail look will match the other front porch area. I started crying when we found the only historic photo of our house we have in the research library, so I know how happy you must be! I love that glassed in porch, though I’d be willing to bet that the glazing was a later addition to what was originally an open porch. Someone mentioned researching your street address, I just wanted to add that address numbers, and even street names can change over time (our house has had three) – so pay attention to those things on the plat books and Sanborn maps, not just to the house itself. Also, the detailed keys to both of those types of maps are usually on the first few pages on the book, not the map itself – some of the information they contain is amazing, and easily missed if you don’t know what the colors and symbols mean. Do you have a county historical society? We have a county historical society and one can check out the library (loads of pictures) for a small hourly fee. This is something I’ve been wanting to do on a rainy day, yet haven’t so far. I’m hoping to find an old picture of a local mountain or waterfall and have a copy made (they do that) to hang in my home. We just bought a 1928 craftsman house, and we are starting the process of uncovering its history. We have what may prove to be fake windows on the back of the house. (They are no longer windows because they are in our bathroom, and one is on the wet wall. But they might never have been actual windows. That’s the part we’re trying to figure out.) My real estate agent suggested the shutter treatment that you have in the 1950 photo! I think it’s a charming way to make the house look a little nicer, and it’s just plain funny, too. I think that the porch looks lovely in the 1950 photos, but I don’t know that you need it. I would probably make the same call myself. It’s pretty common in 1920s bathrooms to have a window on the wet wall. Most bathtubs didn’t have a shower head, and even if they did ventilation/light was more important. Of course your bathroom may also be an addition, especially if it’s not the only one in the house. I would look at other homes in your neighborhood of the same vintage before committing to something like shutters though to try and find a style that matches both the vintage and architecture. Such a great find! And so much history and knowledge from just one picture! I LIVE for these sorts of comparisons: how have things evolved over time? How have modern contraptions (like vinyl siding or those lovely chain link fences) impacted the life (or demise) of buildings? What stories are attached to these locations? Thank you so much for sharing this find with us–and I remain excited to see what else you dig up! I love your posts. Your texts are amazing. When I read them I feel like we are in a living room having coffee, having a nice conversation… Congrats! Your house is beautiful! Love this style. And I love the fact it’s white. Always looking forward to check next posts! Great find! It’s a bit of a long shot, but you could try looking at the census records for your address, then you could find out who was living there in it’s earlier days, and that may lead you to photos. When I was tracing my family tree I used Ancestry.com a lot and found that many users had photos posted of old family homes. This is a fabulous gift Daniel! You have, no doubt, spent hours gazing at the vintage photo looking for hints and clues to the past. I am sure there are other images out there to be found. BTW, I appreciate your viewpoint of gratitude for the house. Being grateful for what we have only gives us the opportunity to have more. I grew up in a Greek revival house (built in the 1850s/60s) that did indeed have fake windows with the shutters closed over the “windows,” just like in the old photo of your house. This was a common thing. It was also a house that didn’t have a ton of embellishment: no columns, no fancy cornices (it’s in Maine, where the architecture runs to severe). I completely agree with ripping off that porch. Do it. This is so cool! I love the dummy windows, I’ve seen that on a few old houses, it seemed to be a trick they fell back on when practicality called for a wall but symmetry called for a window. My favourite thing is the tree though, I get a real kick out of seeing it as a skinny young sapling, and then again as a crusty old geezer, it really highlights just how much time has passed. I also wondered whether the side porch windows could have possibly been reborn in that strange glass partition?! Anyways, this post made my heart sing. Thank you! I wondered that, too, but I think the strange glass partition wall welllll pre-dates the destruction of the side porch window situation. I think the wall was put up in the 30s and I’m guessing the new windows went into the side porch in the 80s or 90s. For those back windows… couldn’t you use french doors as windows? I’m not really sure I follow! Which windows? Sorry! I think Serenity is suggesting that if you wanted to try restoring the sun porch, rather than tearing it out, you could use old french doors to replicate the look of the huge glazed windows. I’m a sucker for this kid of sun parch glazing that seems to be popular on houses from the 1910s-1930s (I think – not an expert on this), so I would be tempted to try to bring it back – but does sound like the structural issues with it would be a bear to deal with. If you were able to do it though, you could make it a sort of solarium and fill it with orange trees and stuff – would be totally amazing! (and tons of work, but you love that, right?!). So cool. Being the plant freak that I am and given all the work you have done to your front yard, I am curious about the trimmed shrubs in the old pics. It’s strange, but the way they are pruned and the thickness of the branches by the covered porch remind me of crepe myrtles. Any ideas? I have NO IDEA what they are! There are a couple of houses around that have similar plantings around the property line, but I don’t know what those are either! Could be lilacs or hydrangea. Oh, very cool!! Thank you!! There is a historical society, but they didn’t seem to have anything! Oh well. I suppose there are probably insurance records, but I don’t know how far back they would go or how I would get access to them! The tree in front is a honey locust! Hard to tell what the side street trees were in the old photo, maybe oak. It just needs some trimming! Honey Locusts are great urban trees. They’re drought and salt tolerant, have beautiful bright yellow fall color, and have such tiny leaves that you don’t really have to rake up after them. Yours just needs to be limbed up and given a good thoughtful trim. Limb it up yourself this winter, cut out any deadwood or crossing/weird branches. When you get around to it, hire a GOOD tree guy (get recommendations) and have them shape the top. It’s pretty hard to destroy a honey locust, even with years of mistreatment. It wasn’t a “porch”. It’s a conservatory. A very common feature in colonial architecture, commonly used in the derived Georgian architecture. Another feature of that style is … you guessed it: Symmetrical window arrangements. If you check out the Wikipedia page on that topic, you’ll find them mentioned. This common architectural concept has wrongly been conflated with the existence of window taxing, where property taxes were connected to the amount of windows. This is discussed in British TV show QI, the episode called Inland Revenue, 10 mins and 24 secs in. Link below. On the continent, you’ll find many faux windows on buildings older than England, let alone the US. Colonial Revival architecture drew on the Georgian, which drew on the Gothic Revival, which drew on the … Gothic Architecture. Which in turn had nothing to do with the Goths (Swedes today), but that’s not the point. The point is that McMansions didn’t invent the faux window, and that conservatories were, and still are, an important part of many houses …at least in Europe. So I don’t agree that it’s a “bump”. I think it could, once again, be a beautiful part of the house. Another term for faux window is “blind window”. But because of Microsoft, that’s difficult to Google effectively. “Faux window” is from French, “fausse fenêtre”. You’re a font of information Rasmus! I agree, when I saw the ‘windowed porch’ on the side I thought ‘conservatory’ , lovely! I thought the Goths were Germans! Yeah, that’s another commonly held fallacy. It’s not entirely untrue, but the goths never really held the areas now called Germany. But they passed it several times. The Gothic architecture was named such as an insult, because the Visigoths sacked Rome. The original “base” of the Goths was further north than Germany, and the word itself is from Norse. The second largest city in Sweden is Götaborg (Gothen|burg = castle of the Goths), and a large part of the area currently occupied by Sweden is Götaland (Goth|land). The house I grew up in is 138 years old, and we got a photo of it from around 1920 once (with the owners at the time in the picture!). The house is the oldest one on the block and used to have the entire square block as its property. It was so cool to see that photo. We even got to speak to a woman who lived in the house in the early 1900s once, when I was a kid. She was about 90 when we met her, so it was a real treat. I think my favorite part of the older photo is the darker rake at the roof. When you did the roof/gutter replacement, were you able to access that wood? If it’s still intact and not too heavily weathered/rotted, you can definitely get it analyzed to find out the original colors. (I do historic paint investigations for a living, so if you are really curious, let me know. I know I’m dying of curiosity!) I really hope there’s some cladding or trim under all that siding too, but that’s probably too much to hope for. I’m not totally sure what you mean! The darker color around the top of the cornice is just the crown molding painted dark, which is still there! Unfortunately it’s in AWFUL shape—rotted, eaten away by animals, missing in places—so I want to try to have it replicated (it’s a very simple profile) and restored. Again…probably a long-term goal kind of project. The original clapboard is right under the vinyl siding! Everything I’ve seen of it looks like it’s in totally fine shape—it seems like it was just put up as a maintenance free alternative to repainting the house every so often. I think the only things that will be missing are the window sills and parts of the moldings above the windows. I kind of just need to come up with a plan for dealing with that, and some money, and some time…but someday! Wow. Fake windows is a thing? Why bother? To make the house fancier! The whole idea with this kind of architecture is balance and symmetry, so while it doesn’t *actually* make sense to have windows in those locations inside the house, it looked better from the outside! I love them! I love finding out about stuff like this, even if of the area in which I live in. It’s fun to dig around and see how local traditions began and such, let alone how your house and neighborhood was like when it was newer. It’ll be interesting to see what more you can dig up, and with this photo to compare what was in 1950, Vs what it is today and see how far you’ve come, and how far you need to go. I didn’t even notice the missing chimney initially but scrolling back up, I see it now and I totally get why you had to do that, though I did notice you kept the one out back though. it does appear to be in the vintage photo as well. I also understand if you need to remove the side porch and bump out above as they look like they were just tacked on, especially the porch, the upper bump out looks to have been integrated better, thanks to not having to contend with a bay window. I hope you can get back and dig deeper back into the archives before too long. LOVE you old photos and info! We now live in San Diego-the place of our dreams-but for four cold winters we lived near Bend, OR. We too have 1950’s outside pix, but they aren’t scanned.The house looked the same but we really changed up the landscaping. 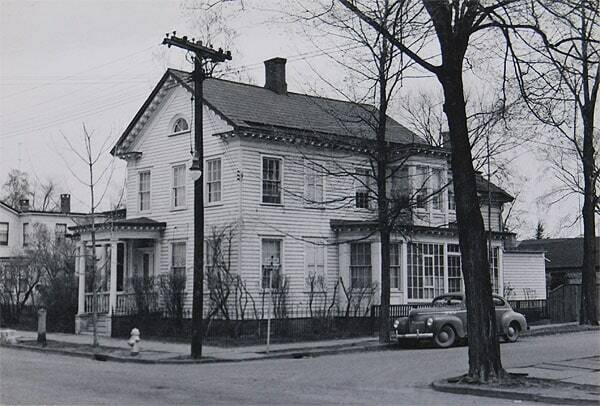 In our 1950 photo, there was nothing much save a tree out front and grass. I am over the moon happy to now live where we live, but I will always love the little house on the top of a hill that overlooked the entire tiny town of Madras, OR. That is so cool to get that photograph. I think you’ll definitely get a lot of light from losing the enclosed porch. I think you should plant new trees in the side hell strip. You said that was the south side of the house and trees could significantly help with the heat problems in the summer. Check with your city though before selecting what trees to plant. Usually the hell strip is city property and in recent years, most cities have created lists of recommended trees for hell strips based on the width. These rules were born out of two issues, having to trim trees around power/phone lines, and sidewalk/street damage caused by large root systems. The trunk and protruding roots of the Maple tree in front of my house has completely filled the 5′ width and had lifted sections of the sidewalk by 4″ or more. Just last year my neighborhood received some grant money for sidewalk repair (otherwise it falls to homeowners to pay for the repair $$$). When they repaired my section, the new sidewalk had to slope up over the roots (sidewalk is almost 12″ higher than the street on the other side of the trunk) and also curves out around the trunk to give the tree a little breathing room. All that to say, that I think trees are a great idea, but it is a good idea to identify what species will best fit the available space. It will benefit you and future homeowners, and your city might care what you plant there since it’s technically their land – they just hold you responsible for maintaining it and paying for repair/maintenance/tree trimming. I love my big tree but it is kind of a PITA. Hey Daniel, do you know what the black rectangle thing is on the right corner of the roof? I thought it was a solar panel at first but then I noticed it was also in the 1950s photo. Just to the right of the farthest windows on the top floor. Is it just a divot? i love stuff like this! i did similar research a few years ago after buying my 100+ yr old home. i found that our neighborhood had recently done a house-by-house historical analysis which gave me a lot of info without having to do all of the research myself. i learned of other tools you can look into: Sanborn Maps and City Directories. Our City Directories were published by R. L. Polk & Co and J.C. Parker. I have no idea if those are national or regional companies, but it might provide a starting point. (Just looked, J.C. Parker was a local printing company.) The directories are published in the Library of Congress. you might also look into county historical/archives, if the town of kingston doesn’t have much. good luck! I second the City Directory suggestion. In a lot of places they were known as Blue Books because they had blue covers, and they were essentially phone books and the precursor to phone books. They listed people alphabetically by name, but more importantly you can search by street and address, and find out who lived in the house and often their profession. Its especially interesting because you can compare who owned the house from your title search, to who lived in the house. You can also learn about the neighbors and see who they were and what they did. I think they came out every couple of years. Long time reader, first time commenter. Amateur genealogist. Not a stalker. I have always been curious about the age of your house. I think I figured out where it is, and then went looking at the various censuses to find the name of the family that lived there. If I have it right, if you go to Hudson River Valley Heritage Historical Newspapers website http://news.hrvh.org/ and search for “death William [last name of family]” you should find an obituary that says he built the house in 1865. WOW WOW WOW! I had no idea that website existed, and you’re absolutely right! That’s amazing!! That obituary is so incredible, too——I knew his name, but nothing else really about him. Very, very cool. Thank you so much! It looks like the builder and original owner of the house was a Kingston native born in 1828. He built the house circa 1865 (which is interesting, because usually post and beam construction indicates pre-1850s, which is why I thought it was a little older), and lived here until his death in 1905. He was apparently a prominent resident of the county and very politically active in the community, and even served as the fist alderman of our ward after the city’s incorporation! After his death, his son remained at the house until his own death in 1962—so, effectively, the house was in the same family for nearly 100 years. Down the rabbit hole I go…now I want to know EVERYTHING. I was thinking the house was a little younger than you were thinking – just comparing it with the housing stock and ages around here. Cool info. You’ve inspired me to look a little deeper into our house’s history. A good way to check the age of a house is to see when the address first appears in the City Directory. Your library probably has them. Ancestry.com has them. So I looked for your builder/owner. In the 1866 directory it looks like he’s living somewhere else. In the next one – 1869 – he’s in what I think is your house – on a corner, but the street names are different. Over the next 25 years both streets are renamed, the house gets a number, and then it’s renumbered to what it is now – which I think gets you to the date you were first told was when the house was built – which might just be when the tax records were changed. The obituary of the son is there (1963) and it says he was born in the house. Wow! All is revealed! I’ll have to look more into the thing with the windows on the side and get back to you…they were popular around this time period. Think they were actually called tea rooms. (Not conservatories.) So could be original. But I had to smile when we got the house’s original plans for our architect and saw that in 1967, only two electrical outlets were specced for the whole house – one for the fridge and one for the TV. What else would you ever need to plug in!? Our kitchen alone has 12 now! If you are not going for a perfect historical restoration but rather bring back the charm restoration and make it a functional house that you, your family and friends will love, and that some future other homeowners will love and be able to use, then please don’t stress the removal of the chimney. From your description it sounds like it would have cost a lot of money to rebuild it properly, and you would not have the usable space you are going to have in the attic. Any new homeowner that would buy a restored/remodeled house will want maximum usable beautiful spaces. And beautiful usable spaces is what you are brilliant at. Congrats on getting your historical photo. Wow. When I get drunk at a party, different things happen! Can I offer a European viewpoint, like you mentioned? I think in general, a house, especially a really old one, can really suffer if you ask ‘Is this original?’ too much. A building has a history, and every decade it lives through, will add a bit of character to it. Like the seasons adding another growth ring to a tree, I guess. If somebody added something ugly, get rid of it, but if it fits well, let it be. You don’t live in a museum. Ideally, you guys should add your own growth ring to its history! Great post! You can look through the register of probate in the town for old wills/estates to find the inheritance of the property, too, though it might not be needed if you know who all the prior owners were. Sometimes you can find what possessions/furniture were deeded in an estate, too. (like some coal shovels and a murphy bed that were part of the sale of my home at one point in the 1920s). I wonder if the front steps were originally wood, rather than stone or concrete? That would make the lip/bevel on the tread easier to understand. Maybe the columns rested on stone (though the panel beneath them looks wooden to me, too) and the steps were wood, like the banister/railing? I love the hitching post and “upping stone” — hope you will replace them. I have seen an Italianate house in my neighborhood that has several shuttered windows. I always assumed they were just keeping them shut to keep out the sun, but maybe they’re dummy windows, too. I’ll take a closer look the next time I pass by. I love all your posts, but this is one of my all time faves! I don’t know about the front steps! Amy L, below, brought up that the whole base of the steps look different, and I think she’s right. I’m actually guessing that it was totally rebuilt (or maybe covered?) at some point, and that they reused the original bluestone slabs to finish it off. But who knows! – Rasmus is spot on about the blind windows. I realized immediately what they were (even before reading down the post) because I’ve seen them several times before. They’re there simply for aesthetic balance; I’ve always admired how old-timey builders were much more careful with proportion, shape and line than builders are today (nothing drives me more crazy than seeing a few mis-matched, randomly placed windows in a sea of vinyl on the back of a mcmansion). – While I like the bump out, I think your assessment and solution are for the best. The porch is dreadful, and the bump out’s shape and position isn’t coherent to the exterior as a whole. – Are you certain that the current base of the front porch is the same as in the picture? Clues: the old porch looks like it’s sagging a bit; the bottom of the old columns are level with the porch floor and yours are raised up on a concrete plinth; and finally, the newer concrete bases look more massive. What do you think? – About the porch railing: I’ve gotten quite reasonable prices from an iron work guy for manufacturing custom railings. They’re not wrought iron, but by using solid (or thick walled hollow) rods you might be able to approximate the fence design in a way that would be aesthetically pleasing AND less maintenance. All in all, you’re doing a marvelous job on the house — thanks for sharing the process with us! You know, I have no idea if the current base of the front entrance is the same! I think all your observations are correct—it’s very possible the whole thing was just rebuilt at some point! I wonder if my neighbors across the street would remember…they’ve been here since 1956! You know, I really should price out having something made to approximate the original fencing. It doesn’t have to be an exact match, but something like what you’re describing could be really amazing. Maybe it isn’t as expensive as I’m assuming it would be! I noticed that the two column bases (that are on the side of each of the front steps) look a bit larger in the current version than they were in the 50’s. That is pretty standard for older houses and usually when remodeling (at least recently), people generally enlarge the bases to make the entrance seem more majestic. But it also seems from comparing the two photos that the front wrought iron goes right up to the old porch line. So that means the wrought iron you have now is newer than the version in 50’s or that it got moved or had surgery done on it to accommodate. I like the bases large like they are now, but there is a stone that the columns sit on that is smaller than the base and it looks a little off. I have no suggestion to make but I am sure you will figure something out that makes all work out lovely. I just wanted to say that I love how much you love your house. I love how hard you are working to restore it. I even love that you are going to make your house “smaller.” I don’t think the point of restoration is to make the house exactly the way it was before – the point is to keep the house alive and thriving in the current times while still maintaining original character. If the chimney could not be saved, so be it! You’re going to make the bay window a focal point again and that ought to even out the chimney sitch IMO. You’re doing something really amazing and special here and I truly enjoy every word that you write. Thank you for your blog. when i saw your instagram photo about this post today – i got so excited and waited impatiently to get off work to come home and settle in to read it, like i would do a good book. i didn’t want to hurriedly read it at work, this is something savor. i actually always do this with your posts, they really are that, an amazing story unfolding that i don’t want to rush through. and you tell the story so well! you are the only blogger that i laugh at loud with. i am a long time reader and thought i would post for the first time. thank you for sharing this amazing journey with us! I am so enjoying your blog. It is fun to see the projects you are working on but your writing is what keeps me coming back. I wonder if the side porch was originally a laundry porch or service porch. If the only access was from the kitchen… My great aunt had a house that had a porch that was bare bones. Laundry was hung there, food was stored, etc. Over the next 50 years it became more of a room. When it comes time to dig into that side of the house I’m sure you will be able to decide what to do. Respecting the house doesn’t mean it has to be exactly like it was when it was built. You are doing a good job! This is so good! It’s exciting to find these little gems that give us a glimpse of the past. I love the little bump out and the window style, that would be cool to put back. We have to put shudders back on our house too and I’ve been too chicken to sort through the pile in the basement (who knows how long they’ve been down there). 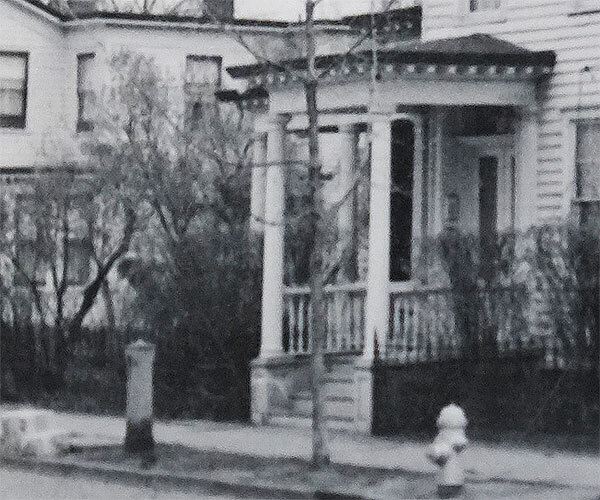 We have a picture of our place from 1860s, and noticed there are two porches that were removed. I want to put those back ASAP and am googling how to do it! LOL. It’s so easy to get obsessed! You have a photo from the EIGHTEEN SIXTIES? That is so awesome. I’m so jealous that you have your shutters!! I know I’m going to end up spending a year milling my own shutters someday, haha. I agree with others about the conservatory bumpout – while it looks interesting, what a lot of work to make it safe and secure and all that money could be spent better on other wonderful things for the lovely house! this house is so lucky to have y’all as its fourth owners – i bet you can feel in its bones how grateful it is for all the work you are doing! I lucked out and found my house featured in the local paper right after it was built. I signed up for newspaper archives and did a search of the classifieds in the local paper for property to sell or rent starting the year my house was built. Apparently my house was a cornerstone showhouse for the new neighborhood development and used to sell contracts. What that means is I now have a half-page add with a photo of the front of the house – my 50 ft tall sycamores in the front were just newly planted saplings. It was great to see how the house looked with it’s original shingle exterior that had been covered with steel siding since. I also was able to see how the original porch lighting and railing looked so I can replicate it. My favorite plan is to have a large engineer print of the ad made and hang it in my entry or living room – I nerdily excited about that. The best part was the ad was a smaller photo of the kitchen – the house was a showcase for some new fangled kitchen appliance, perhaps you’ve heard of them, the electric range. Gosh, how fancy! From that picture, I got confirmation that my kitchen was still 100% original to the house (and mostly still is). I really got a kick out of that. I have no compunctions about demoing that out, though! It is so cool that you are getting all this info. Being a car geek I was trying to identify the car in the picture. This is what I’ve come up with. the concrete beneath the columns on the from steps sorta look hexagonal with a recessed “panel”- looks like something other than a 90 degree angle inward toward the steps. could just be photograph distortion from 3D to 2D. someone earlier mentioned Sanborn maps and I wondered if you had looked into them? I worked for an interior designer who was redoing a town house in the east 70st Historical District, and we had to get Sanborn maps for our presentation to the commission to be allowed to put a 5th floor. Anway, tl;dr: Sanborn maps are cool and you never know what you might get. What a find! Who knows, when you take off the vinyl siding (uugh!) maybe the faux windows will still be there, shutters and all? Have you tried browsing local archtectural salvage yards for things like shutters, fireplaces, wrought iron fencing, et al.? You could also place a few ads locally to see if people in your area have a few shutters lurking in the attic or basement that they’d be willing to get rid of for a few $. You did well to get rid of the chimney for all the perfectly good reasons you mentioned. I do love the old ‘conservatory’ though. Wonderful to see this photo and her close-ups in the day! The southern exposure says it all, so this area might indeed have been an area for winter herbs, plants for the home in Victorian times and a sunny winter spot or “winter garden” or conservatory with an entry to the kitchen and so also kind of original mudroom and servant’s delivery entrance. My grandparent’s house had this with an herb/salad greens garden just outside for summer, as there was more land. Interior shutters are easy to make, you could definitely do this! Love the neighborhood tree drive idea! Best luck. Wow, this makes me actually want to do the same for our own house. It’s only 80 years old, so maybe we can still find out more about it from the beginning on. Btw, even in Europe houses from the 19th century are getting more and more rare, unless you’re living in a historical city center (except for a farm here and there maybe). A Cleveland area history researcher found this picture of our 1920’s house for us (http://cherylandrey.blogspot.com/2011/11/homeowners.html). The first thing I noticed was all the beautiful old shade trees in the front yard – when we bought it, there was nothing but terrible overgrown bushes and thistle (http://cherylandrey.blogspot.com/2011/09/so-its-official.html). And then I realized that the whole entryway had been changed! No more lovely rounded roofline or columns. I later came to find out through one of our older neighbors that one of those beautiful old trees fell on the entryway at some point and the whole thing had to be rebuilt. I guess that brought an end to both the trees and the entryway. I’d love to restore the entryway to it’s original state someday – especially since it shares a lot of characteristics with the other houses in our historical neighborhood. You can still see where the columns stood in the cement of the steps. Unfortunately that’s going to be a ways down the road since we’re still battling the terror of the 1960s & 70s inside the house. Maine is full of Greek revival houses and I was raised in Maine. Blind windows are seen in Greek revival buildings, my grandmother’s house had two, but one was created about 1900 in an addition (originally a story and a half greek revival, the roof was raided and a second story inserted about 1900. there were two blind windows, both to keep the symmetry of the house. Both were where windows were not wanted, in a closet and where a wall separated two rooms. Only one blind window was in the 1840’s part of the house, but it was present in a picture of the house before the 1900 renovation. This principal facades of the house (front and 2 sides) were completely symmetical and needed the blind windows to maintain that symmetry. I loved the look of the story and a halp cape far better than the enlarged house. As for glass porches, I remember many in Maine, but the ones I recall were from the late 19th and early 20th century. Mostly useful for extending the time one could enjoy the sun or put perennial plants that needed a freeze in the winter. They were not heated, so could not be used year round. Have you looked at census records for the people who lived in your house? You’ll find so much interesting information. Great blog. Thanks for saving a beautiful old house. Ha, I’ve been doing that (with a little help from a couple kind readers!) for hours!! Censuses, city directories, newspaper clippings…learning so much!! So fascinating! About the fake windows. Do you know the blog Reggie Darling? Or did you read the Architectural Digest article about the house Bruce Shostak and Craig Fitt restored, in Claverack NY? Anyway, I’ve visited them (lucky me!!!!!) and they have false windows, if I remember correctly. Memo to self: No matter how tempting it is, don’t start reading a post from Daniel when you’re meant to be getting ready to go out, otherwise you will find yourself running late and having to explain how studying before and after photos of a property being renovated is…ahem… not really more important than being on time for the meeting but is…um… rather interesting. I love how you love your old house! My house was built in 1896, and through scouring old newspapers (my city has an extensive historical library & a lot of it is searchable), we found out who sold the land to the builders, what year, & for how much. I also found out that in 1899, my house was up for rent, & at that time had 5 bedrooms! It was going for $40 dollars a month. I also found tax records, including a picture of my house from the 1940 tax census. I don’t know if your town ever did anything like that, but it’s worth finding out. The exterior of my house is exactly the same as it was in 1940, but it’s been opened up, & renovated & made a little more modern on the inside. I like the juxtaposition. I nth the Sanborn Fire Maps, they’re a great resource! Good luck on finding out the history, it’s fun! how exciting! I love watching you pare back all the neglect and find the valuable historic pieces. I totally support you removing the bump out and porch if its not well built and contributing to the house disintigration–it’s not integral and as romantic as it looks if you can’t use that windowed room than you might as well scrap it and go with something more useable. have you ever thought about taking down the railings on the porch without putting up new railings? I grew up in an old house in a historic district in St. Charles, MO and there were a few porches that had columns without railings on houses similar to yours. It may not be original to go without, but unless toddlers are rassling on your porch you may be able to make do without the iron ones until you find something affordable and appropriate to replace them. This is my favorite post so far! Very cool. It bumped ‘the window in the laundry room’ to second favorite. I’m sure these places are everywhere, but I just wanted to let you know about New England Demolition and Salvage in New Bedford MA, http://www.nedsalvage.com. If you’re ever in the Cape Cod area, you could check it out. Lots (and lots) of stuff. We’ve been researching the land we just bought (we have to name the road that leads to it, and wanted to name it after one of the past owners – but so much pressure picking something!). We’ve also been spending hours researching, and have done a lot of the stuff others have suggested (Sanborn maps, censuses, ancestry.com) – but other thing we also did was check out our town library – they have a whole section on the history of the town (I think most libraries do), including photo histories of the town compiled on it’s centennial, old telephone directories, etc. – also, it looks like there’s an “Images of America” book for Kingston and Ulster Township (this is a series of books that compile old photos of towns – they have them for many many historic towns), so you might want to check that out. Finally, you might try the state historical society/museum – New York’s is in Albany, and I think it’s pretty good – you can find things like military records, old maps, gazetteers (listing prominent people, industries, and buildings at the time they were published), and versions of the Sanborn maps that aren’t digitized, etc.,. We were able to find quite a bit of stuff at our State historical society – although a lot of it was the same as what’s on Ancestry.com. Any way to do a little family history work and maybe get some family pictures of interior and outside? Might be worth a shot!! I love old houses and love the way you love yours!! I’d love to know about your old homes owners and family. My family home was built by my grandmother’s father and grandfather in about 1915, so not that old but I’m the fifth generation to grow up there. I’m lucky to have grown up with a seemingly endless supply of photos (a combo of my grandma and her sisters having lots of money to spend on film, and never having to totally empty out the house and risk losing things) from the 20s on, and I loved looking at them. When I was a teenager I used them to figure out where to plant my own gardens, going off of what I could see my grandma and her mother planted in which places. Now I look at them and dream about being able to restore the house someday: rebuilding the original front porch, a barn-style garage, grape arbors…. 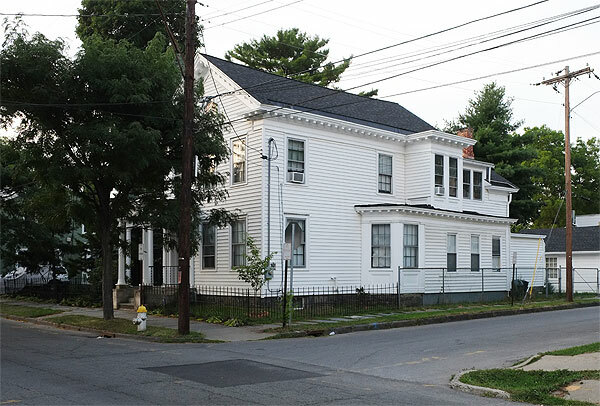 These days I live in the first “modern” apartment house built in the town and I was fortunate to meet a neighbor who’s an avid researcher, she’s identified everyone who’s lived in the building from its opening til the 1970s, and all the property owners going back to about 1850. Her go-tos are the county historical society and their phone directories. Don’t go on one person’s recollections of what their great aunt’s neighbor said; try to find the same piece of information in at least three different places before you take it as fact. Libraries and historical societies in neighboring towns are often more helpful than you may think, too. Hey, if you’re ever in the Philly area or have friends around here that would do you a huge solid, my neighbor has their old wooden porch railing stashed in the garage with no plans to re-use. Thought I would throw that out there…..you never know and it bums me out that they are going to trash it eventually. If you need more space later, having removed the chimney means you can finish off your attic space. Later you could have add a dummy chimney to go with the historically accurate dummy windows you may add back. The chimney looks nice in the old photo, but you absolutely made the right decision. I agree with Amy L regarding the porch railings, it would look great to replicate the form of the iron fencing, whatever may have been there originally. It is such a pleasure to read about your house adventures, Daniel! Our first house was a sweet Spanish style California bungalow c1924. Our second house is a 1958 ranch that was made a bit fancier by the previous owners… It’s pretty comfortable, but any character that it had was eliminated. And if it’s not going to be torn down, that’s the way buyers like them here, so not a lot of adventures for us. I like the hedge, or how you call the row of bushes in the front. Probably looks nice, when it is green. Will you restore it, too? Okay, so I’ve read your blog for awhile, but this week decided to read the archives. I’m SO EXCITED because I just got to January 2013 & saw a picture of your house before it became your house & I have to go read more RIGHT now…! I fully support any of your plans to wallop off non-original chunks of the house. Considering your affection for this particular house and your commitment to realistic-yet-authentic restoration, I think you are guided by excellent principles. I wouldn’t be too concerned about the central chimney, though. Just consider how delighted the neo-classical house builders of the late 1800s would have been if they’d had central heating available: no big chimneys to mar the classical lines! This is the best thing to get your hands on to restore your old house! I’m sure if you do a little more digging you will find more photographs out there to help you. I agree that, although I kinda like the 2nd story bump out and the large windows on the porch in the 1950’s version, they are not original and make the house a bit jumbled on that side. Also it is weird to have a window in the dinning room looking out into an enclosed porch. I think it would be nice to add the fake shuttered windows it definitely balances it all out. The trees on the street really add a warmth and great feeling. It would be nice to get some planted there again. The one in front of your house seems to be a Locust tree hard to tell exactly what type from the photo. I was doing a “Where’s Waldo” over your photographs and realized that the front columns in the 1950’s were a bit longer. At some point the columns must have rotted at the bottom and they were cut off which is why now they have that extra concrete base to make them the right height. Also the garage in the back seems to have a Gambrel roof not a peaked roof like the one you have. I always have to change mental gears when reading US blogs about houses. Where I live in the Welsh Borders we still have houses standing that date back to medieval times. My friend has just moved into a gatehouse that was originally built in the 1400s (it has a dungeon!). I think parts of our local cathedral date from the 12th century. I think we’re a bit lackadaisacal about history though, because we do have so much at our fingertips in the UK. Thank you for sharing the history of your house with us. It must be so awesome to see the photos of it in the 1950s. That’s true, we do really take it for granted. My house is next to a 12th century abbey and when some friends of a friend visited from the states we took a walk up the river to the park (which now I think about it has a Victorian merry go round), half way along we passed a packhorse bridge called “Monks’ Bridge” – being excellent tour guides we went “look – old bridge” and walked on, only for all the Americans to stop and gawp. The date on it is 1350. I don’t know if they were more shocked by the age or of our common dismissal of it! It opened my eyes a little. This is so awesome. We’ve search high and low for photos of our home and have only come up with a single polaroid from the 1970s. We’ve found several circa 1900 photos of historic homes around our home and our place is JUST out of sight. Your really got an amazing gift with this photo. I’m jealous. I think what was done to the side of the house is a lot worse than having lost a chimney. Your restoration plans sound great! It’s possible that before WW II, the wrought iron fence continued around the property. During the war, many homeowners contributed their iron fencing (huge metal drives occurred repeatedly during the war years) for the war effort. North of where I live, there are mansions with street edge fences that now have board filling where their wrought iron used to be. The metal fencing was donated to the government during the early 40s. If the guy who built the house was politically active and well known, there’s got to be photos of it during his lifetime around somewhere. Also, wondering if you could try to get in touch with any of his descendants who might have photos of the house. I am a forester and I cannot help but weigh in on the street tree discussion. The current tree in front of your house is indeed a honey locust, as other commenters have said, which is alternately branched. The tree in the 1950 photograph is oppositely branched, meaning it was likely some kind of maple or ash. So although it looks like they are growing in the same spot, they are different trees. Based on its diameter and relatively fast growth, the honey locust is probably more like 30-40 years old. Anyway, I really enjoy your blog and you inspire me to work on and research my own 100-year-old house. Thanks and keep up the good work. Ok, so I *just* found your blog today. And for the first time, ever, I am looking at someone renovating a house like mine. Now, mind you, my house was reno’d in 1989 (for better or worse) and it is a lot smaller than yours, but it was built in 1873 and is sooo stylistically similar. I have those floor to ceiling windows in the front! I have a curved window up top! I do not have as much nice moulding on the exterior, but my crown is to die for… Oh well. I’m also not in upstate NY, so, you know, pros and cons. I jest. Anyway, I will be watching along as I renovate my place to de-80’s it. And I will feel slightly better about the new roof, boiler, AC, windows, insert-any-expensive-item-here when I see all the plaster work you have had to do. You rock. I hate plaster dust. *rather than someone renovating their new build house in the south for the 3rd time in 7 years. Yawn.